Increasingly the importance of corporate governance for economic development in developing economies like Tanzania is indisputable. This book explores the effectiveness of corporate governance in Tanzania and asks how it can be further developed and improved so as to make a difference in the contribution of state-owned enterprises to the economy. The book tries as fairly as possible to probe further into effective corporate governance, using cases of public entities, highlighting shortfalls in their governance and the consequent multiplier effects on socio-economic life. On the other hand, the book also aims to present examples of good governance in multi-layered ways, to show that there is room for creativity and innovation in applying principles of good corporate governance. Recognising that context is crucial, the book starts by assessing Tanzania’s socio-historical and economic context, and gauging various applicable metrics. 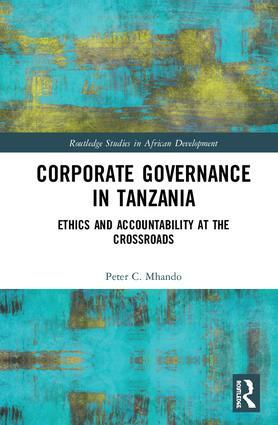 Using historical and theoretical lenses, including the ethics-accountability relationship, the author aims to improve our understanding of corporate failures and consequent waste in Tanzania. Explaining failures in governance is far from straightforward, as by definition they operate beyond rules and regulations, systems and processes, yet the author draws from decades of local experience and expertise in order to assess the real situation on the ground. The Tanzania case will be of considerable interest to researchers looking at questions of corporate governance and economic development both within the country itself, and across Africa. Peter C. Mhando is in the faculty of the Risk Management Department at Smeal College of Business, The Pennsylvania State University, USA. An economics graduate of the University of Dar es Salaam, he received his Masters in Economics and Finance from Binghamton University and earned a PhD from Penn State University. Peter is a native of Tanzania, where he is also a partner at the Centre for Business Excellence (CfBE) and INTERFINi Consultatnts. He is an accomplished economics, finance and management professional with over 25 years of international consulting experience.